Are you protected against the trending viruses in your area? - Pro-Computer Services, Inc.
To effectively prevent viruses today, you have to do more than just run a virus scan. Having up-to-date antivirus software protection is important, but there are thousands of unique variants of each virus out there. And they are all lurking, looking for a single unlocked door to invade your network! Have you ever heard this from an employee? No single anti-virus product can protect your computers from every threat. Even computers that are scanned daily can be vulnerable to emerging zero-day vulnerabilities. When your business depends on the uptime of your network, wouldn’t you want to know which viruses have the most probability of infecting your computers? At Pro-Computer Services we keep a tab on all currently trending viruses. Our scans and prevention methods target the viruses with which your computers are most likely to be infected. 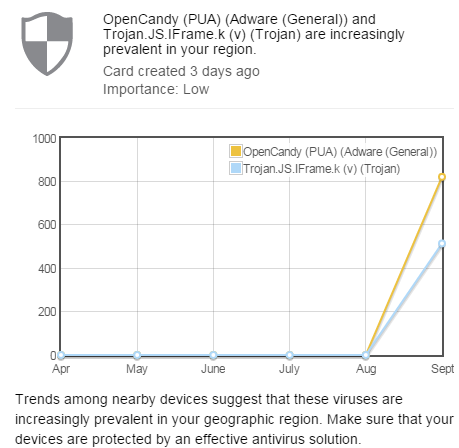 For example, we have researched both the OpenCandy and Trojan.JS.IFrame.k viruses and have developed methods to prevent and remove them. Our Pain-Free IT customers benefit from our ability to monitor their networks 24 x 7 for signs of these viruses. In the unlikely event either of these viruses are found, we will be immediately notified of the infections, allowing us to take quick action to protect your business. Understanding current trends and being proactive are both signs of an experienced IT service provider. We take your business seriously at Pro-Computer and are always improving our services to provide our customers with the absolute best possible IT support. Call us today for a free consultation and security assessment. PreviousWhat if your business got hacked over the weekend?